After years of neglect, Capital Region Water’s proud employees work daily to inspect, clean, repair, and replace Harrisburg’s water infrastructure to protect public health and the environment. 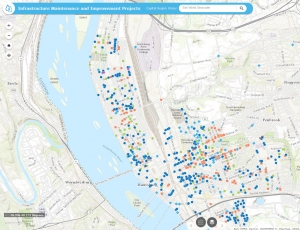 T his map is dynamically connected to Capital Region Water’s work order system and is designed to give you an idea of what Capital Region Water is working on throughout Harrisburg. See a problem in your neighborhood? Report it here.